Jordan Dail pitched Oregon to a win over Missouri and completed the weekend with a 3-0 record. Photo - GoDucks.com. Weekend 1 of Division I college games are officially in the book for 2019. Teams gathered to play in pre-conference tournaments coast to coast and even south of the border as a plethora of multi-team tournaments took place and teams faced off to get the 2019 campaign started. With surprises, disappointments, and upsets galore, here are some of our biggest takeaways from Week 1 of college softball. After one of the most tumultuous offseasons in recent memory, the Ducks were picked to finish last in the Pac-12 and many didn’t know what to make of the team’s somewhat-ramshackle roster. 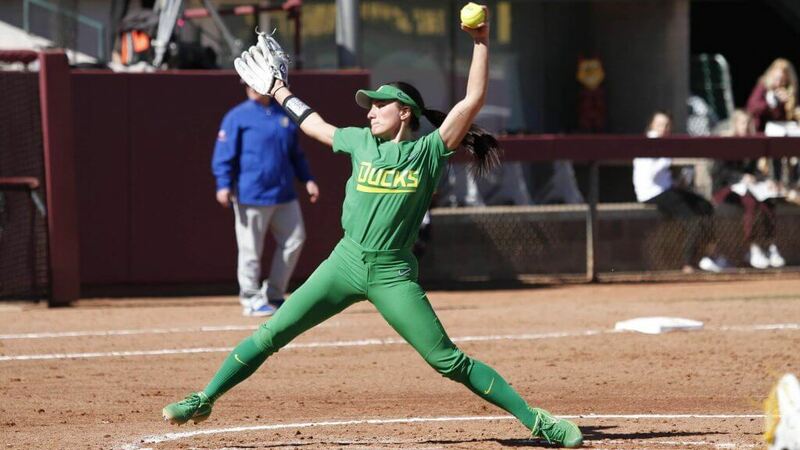 In Missy Lombardi’s first game as head coach, against Kansas at the Kajikawa Classic, the Ducks put together a 14-run win over the Jayhawks that included four home runs and a four-hit, 10-strikeout performance from former Virginia Tech transfer Jordan Dail. The Ducks went on to record victories over Cal State Northridge (CSUN); Missouri; Bradley; and Seattle to begin the year with a 5-0 mark. Two teams competing at the Division I level for the first time ever – North Alabama and Cal Baptist – earned their inaugural D1 wins during opening week. The UNA Lions actually went 3-0 to open their season, with a tight 1-0 win over UAB to begin their season and a pair of victories over Alcorn State following. The Lions allowed just fifteen hits and four runs across the trio of games. For the Lancers' part, a 12-inning, one-run loss to North Texas started their season, as they played the Mean Green to the limit. Despite lopsided losses to Texas A&M and Northern Colorado, the program recorded its own inaugural victory in a rematch against North Texas on Saturday, this time coming out on the top side of a tight, one-run game. A number of rookie head coaches also recorded their own first career victories-- those ranks include UAB head coach Jimmy Kolaitis; Austin Peay’s Kassie Stanfill; Campbell head coach Sharonda McDonald; Louisiana-Monroe’s Molly Fichtner; St. John’s head coach Bob Guerrero; Kennesaw State’s Tripp MacKay and Boise State head coach Maggie Livreri.